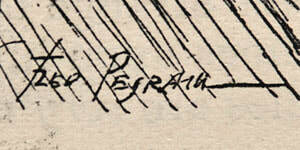 Pegram, a cousin of fellow Punch cartoonists Charles and Henry Brock, studied at the Westminster School of Art. He began submitting sketches to the Pall Mall Gazette, and thereafter had his black and white work published widely in a variety magazines and journals. In addition to his published work, Pegram was a noted portraitist, watercolour artist (he was elected a member of the Royal Institute of Painters in Watercolour in 1925) and etcher.